Although the Portuguese Royal family had fled Europe ahead of Napoleon’s army, their respect for French culture was as strong as their fear of French military might. In establishing Rio de Janeiro as the centre of the new Kingdom of Portugal, Brazil and the Algarve turned to France for inspiration. All over old Rio Centro there are lovely little pockets of la belle France. The first regent, Dom JoaoVI, drew heavily on the expertise of the French Mission which arrived in Rio in 1816. The Mission brought many artists, including Jean Baptiste Debret and Nicolas Taunay, who were instrumental in the development of a national art. It also brought a number of paintings which were to form the basis of a national collection. Most importantly, the Mission brought architects like Grandjean de Montigny, who shaped much of the cityscape of old Rio, including the beautiful neo-classical building in Avenida Branco, which is now the Museu de Belas Artes. De Montigny’s greatest triumph, however, was the Casa Franca-Brasil on Rua Visconde de Itaborai. This magnificent neo-classical building has twenty four Doric columns, made of wood, but painted in a trompe l’oeil marble effect, supporting a huge dome with a central skylight. It first opened in 1820 as the city stock exchange. After stints as a customs house and a bank archive, the Casa Fraca-Brasil is now a cultural centre. Over the next century the people of Rio continued to look to France. The Belle Epoque took its own special form in Rio Centro. 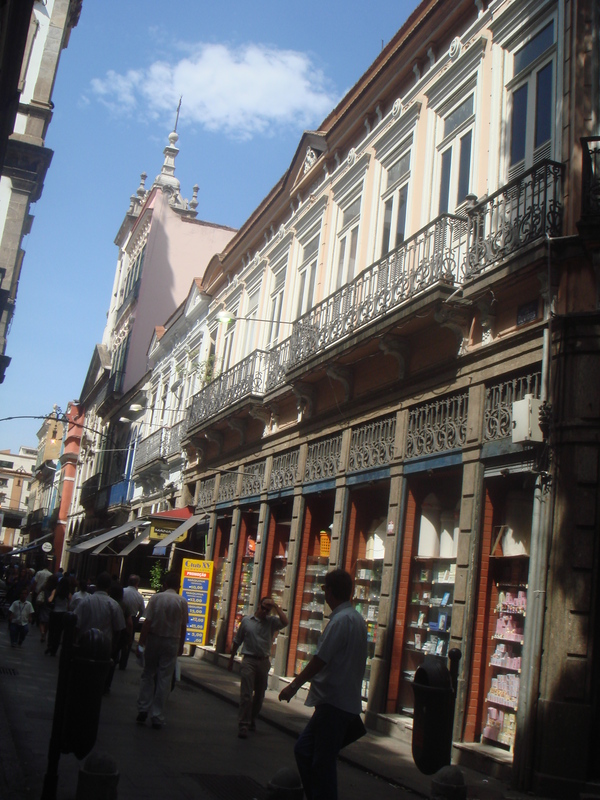 Narrow, quaint Rua Ouvidor is lined with cafes, bars and tiny shops with an air of old Paris. The Confiteria Manon and even more so, the Confiteiria Colombo, in Rua Concalvas Dias, have all the style of Parisen Salons de Thé. The faded grandeur of Amarello, on Cinelandia’s Avenida Rio Branco, smacks of the brasseries of Paris. Nearby, the Teatro Municipal, designed by Francisco Oliveira Passos and opened in 1909, is modeled on the Paris Opera. Rio’s architectural and cultural debt to France was brilliantly acknowledged in 2009’s Carnaval. Samba school Grande Rio chose France in Rio as its theme and not only rebuilt old “French” Rio, but also brought to life the “style de vie” of those times. The coup de grace was that the French Government funded the venture!